Social2Search is an advertising-supported application that was created for the sole purpose of generating web traffic. It gets distributed with the help of freeware and shareware bundles. In most cases, computer users do not notice installing this program at all. The adware is compatible with all major browsers including Mozilla Firefox, Google Chrome, and Internet Explorer. It floods you with various commercial adverts, not all of which can be trusted. If you want to eliminate the unreliable ads from your browsers and go back to uninterrupted online surfing, you should terminate Social2Search without hesitation. 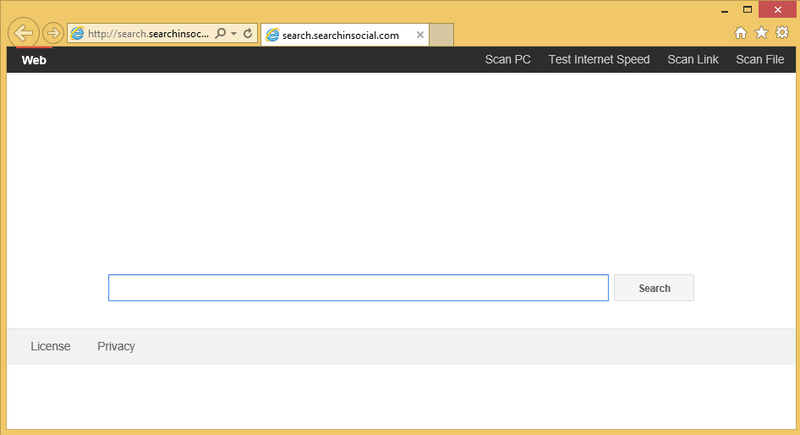 As it has already been mentioned, Social2Search gets distributed through freeware and shareware. It is attached to free third party software that you can download from sites like cnet.com, soft32.com, softonic.com, filewin.com, brothersoft.com and similar. During freeware installation you are presented with additional offers. These offers are usually difficult to notice and thus most computer users agree to them unwittingly. It is, however, possible to avoid the potentially unwanted and ad-supported applications that are presented to you in the installation wizards. What you need to do is choose Advanced or Custom installation mode and deselect all unfamiliar components. That way you will only install the software that you actually need. Once the ad-supported application gets access to your PC, it adds an extension to your browsers. This extension allows it to insert various pop-ups, banners, hyperlinks, and other ads into your visited pages. It does not matter what is the content of the page and whether it has anything to do with online shopping or not, you will still see adverts on it. We do not recommend clicking on the presented ads, because they may be unsafe. The advertisements are not endorsed by the application and it does not discriminate between fake and legitimate ads. You will be exposed to both. If you do not wish to accidentally click on unreliable advertisements, you should stay away from all commercial content before you delete Social2Search altogether. 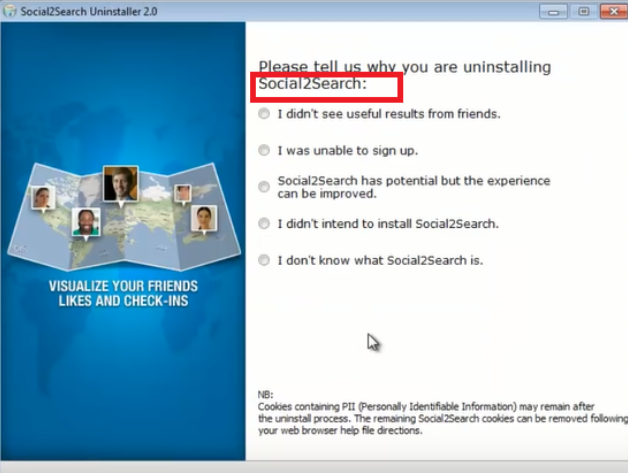 If you want to get rid of Social2Search Ads, you will have to uninstall the adware from your computer and remove it from Extensions. You can do that manually or automatically. If you choose manual Social2Search removal, you are welcome to use the instructions we have prepared below. If, however, you wish to not only eliminate Social2Search ads from your browsers, but also make sure that there are no other unwanted programs on your PC, you should go with automatic removal instead. Download the security tool from our page and let it perform a system scan. Once it detects all potential threats, you will be able to delete Social2Search along with them. In addition to that, you will also be making sure that your computer stays protected in the future as the utility also functions as a malware prevention tool.